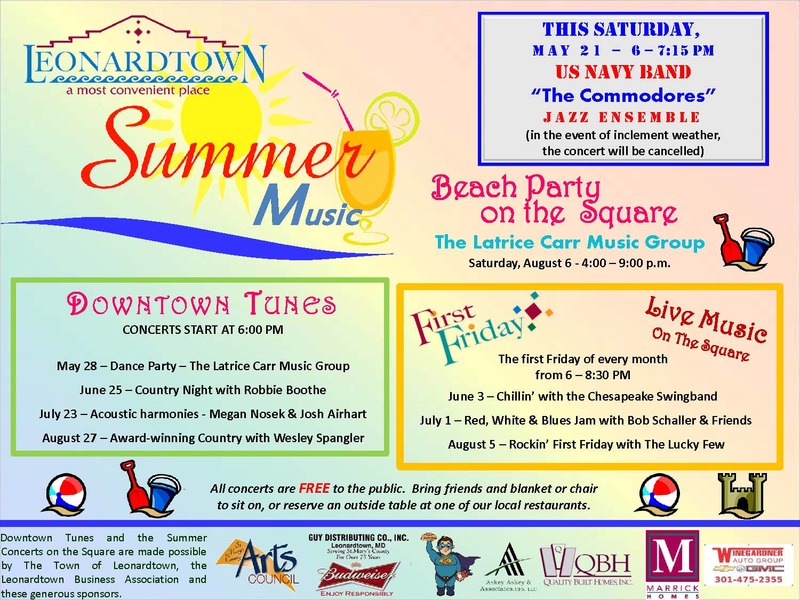 Leonardtown Maryland News: Music All Summer Long! If the weather holds, the season starts this Saturday the 21st with the US Navy Band on the Square at 6 PM. (If it rains, we will have to cancel, so keep hoping that storm moves through fast!) 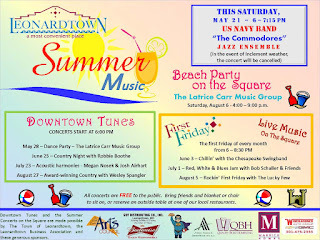 Not shown on this ad are 2 concerts on Friday, June 10: the Southern Maryland Youth Orchestra & Choir Concert at the Leonardtown Wharf at 6:30 p.m. and a Summer Kickoff outdoor concert at the Olde Town Pub with Justin Myles from 4-7 p.m. and Robbie Boothe from 7 - 10 p.m. Can't get enough music? Keep watching our Facebook page - we might be scheduling a few more before Summer '16 is over!